Andres Iniesta [ ] took his penchant for scoring dramatic goals to new heights on Sunday when the midfielder smashed home the winner deep into extra time to give Spain their first World Cup triumph. The shy, pale lad from Fuentealbilla near Albacete stirred memories of his stunning Champions League [ ] effort at Chelsea in the 2008/09 season when he controlled a Cesc Fabregas [ ] pass and drove the ball past Netherlands keeper Maarten Stekelenburg [ ]. It was the only goal in a crushingly tense final. Tearing off his shirt, as he did at Stamford Bridge [ ], the 26-year-old raced to the corner flag where he was engulfed by team mates already wildly celebrating in the knowledge that Spain's hour on soccer's biggest stage had finally come. "It's unbelievable, incredible," an emotional Iniesta said in a pitchside interview at Soccer City moments before Spain captain Iker Casillas [ ] hoisted the gilded trophy. "It took a lot of energy," added the midfielder. "To win a World Cup is an indescribable feeling. "This was our work that we started a long time ago, it was hard work but we're savouring this now." Iniesta said his goal was for his family and Espanyol captain Dani Jarque, who collapsed and died aged 26 on a pre-season tour of Italy [ ] in August 2009. 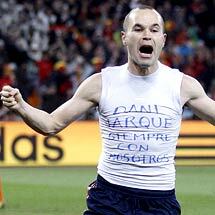 "I wanted to carry Dani with me," Iniesta told a news conference after picking up his man of the match award. "We wanted to pay tribute to him and we thought it was the best opportunity to do so," he added before team mates Cesc Fabregas, Gerard Pique [ ] and Carles Puyol [ ], beers in hand, burst into the room chanting "Spain! Spain!" A product of Barcelona's youth academy, Iniesta joined the Catalan club at the age of 12, breaking into the first team in October 2002 and quickly making a name for himself as a hugely skilful and creative attacking midfielder. He made his debut for Spain in May 2006 in a 0-0 draw against Russia [ ] in Albacete and his goal on Sunday was his eighth in his 49th appearance. After a difficult season plagued with niggling injuries, during which he scored only one league goal, he has come good in South Africa [ ], having also scored against Chile in the 2-1 Group H victory in Pretoria. Spain's Prince Felipe, who was at the match with his wife Princess Letizia and mother Queen Sofia, said: "This goal was a godsend. Iniesta has lifted us to glory."